There have been indications for decades that there is a link between increased iron levels in the brain and Alzheimer's disease. Leiden physicists now report a distinction between different forms of iron, identifying specific iron forms that increase in Alzheimer's patients. The research is published in Scientific Reports. Iron plays an important role in biological processes, including those in the brain. With cerebral disorders such as Alzheimer's disease, there are indications that the iron balance is disturbed, because researchers measure increased iron content. To measure iron, scientists use an MRI scanner, which detects iron content indirectly. Lucia Bossoni from the Leiden Institute of Physics and the Leiden University Medical Center and her colleagues have now combined MRI with EPR and SQUID magnetometry. This enables them to distinguish different shapes in which iron occurs. They confirm previous studies that establish a link between increased iron content and Alzheimer's disease, while making this connection specific for individual iron forms. 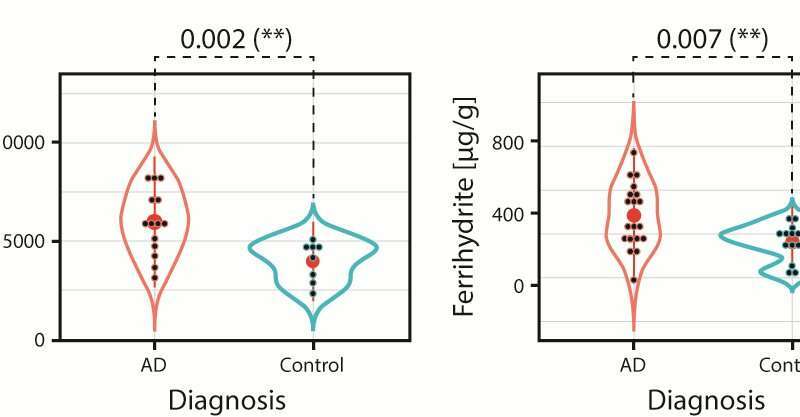 For example, the iron concentration in the mineral ferrihydrite is higher in the group of Alzheimer's patients than in the control group (see figure). In addition, Bossoni spots a trend where certain iron forms correlate with the Braak stage. The iron concentration in the protein ferritin and the magnetic moment of the mineral magnetite appear to increase as Alzheimer's disease reaches a more advanced stage. Bossoni says, "When we talk about iron increase in connection with neurodegenerative diseases, we have to pay extra attention to the specific iron form that really matters."